Located in the western region of the USA, Montana is ranked 4th in size and 48th in population density. The state’s economy is based primarily on agriculture, but also on other economic activities like mining, healthcare, and government services. Tourism also plays an important part in Montana’s economy. Millions of people come annually to visit Yellowstone National Park or Glacier National Park. When incorporating in the USA, you must make sure your personal assets are well kept.Whether you form a C-corporation or an LLC, opening a US Bank Account helps you keep your individual belongings separated from the business assets in case of a lawsuit or any other problematic business claims. The state of Montana requires that a C corporation or an LLC mustn’t have a name that can be confused with another business carrying a similar sounding name. A different incorporation name raises your company reputation and also acts as a brand identity protection. To make sure your business name is eligible check out our free corporate name search section. Montana imposes two types of taxes in Montana: corporate taxes based on the company’s net revenue and individual taxes based on the owners’ personal income. LLCs can choose which charging method they prefer for federal tax purposes and the taxes are more flexible for this entity. There is no legal specification which implies that business owners choosing to form a company in this American state must own a Montana physical address. However, before your firm is legally eligible to operate, make sure you possess all the required business licenses, permits, and tax registrations. If you need help, Inc. Plan can help you with all the hassle. The Montana law considers both C-corps and LLCs to be eligible if they have one or more members and there are no age restrictions imposed. However, LLCs must include the names and addresses of its members in the incorporation files. LLC names are allowed to end with the terms “Limited Liability Company”, “Limited Company” or the abbreviations “LC”, “LLC” and “L.L.C.”. The incorporation name must be unique and distinctive from the names of any other business. If you decide to incorporate an LLC in Montana, then the formation document, you are required to file, is called Articles of Organization. Additionally, Montana-based LLCs are required to submit an annual report between January 1st and April 15th. The fee for the annual report is $15. The Articles of Organization must include the name and address of a registered agent which resides in Montana, and which is available to manage legal and tax business documentation. For more help with the incorporation filing or registered agent services, feel free to contact Inc. Plan (USA). For tax purposes, Montana LLCs follow the federal rules and will not be charged based on their net revenue, but based on their members’ personal income return. LLCs can also choose to be taxed as partnerships or C-corps. Each of the 50 American states has its requirements for incorporating. The essential requirements for C- corporations established in Montana are as follow. 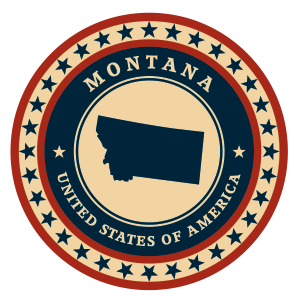 The organization name designations allowed in Montana can include the terms “Company”, “Corporation”, “Incorporated” or “Limited”, along with their abbreviations. The incorporation name must be unique and distinctive from the names of any other business. In order to form a corporation in Montana, entrepreneurs must file an incorporation document called Articles of Incorporation and an annual report which is due between January 1st and April 15th. Te fee for the annual report is $15. The Articles of Incorporation require a listing of the company’s authorized shares and per value, as well as the name and address of a registered agent with a physical Montana address. Any increase in the share number can affect the initial filing fees. Inc. Plan (USA) can help you with the necessary filings and also with qualified registered agent service. The state of Montana imposes a Corporate License Tax for all domestic and foreign C corporations. The tax rate applied is 6.75% and is calculated based on the net income generated from transactions computed in Montana. Additionally, C-Corps that conduct sales and don’t own or rent any property in the state can apply for an alternative tax at a 0.5% rate of gross sales. C-corps that are obtaining revenue from Montana sources, but not subjected to the Corporate License Tax, must pay a complementary corporation income tax.